IN THIS FILE PHOTO, MEMBERS OF THE EXECUTIVE BOARD VOTE on a motion. 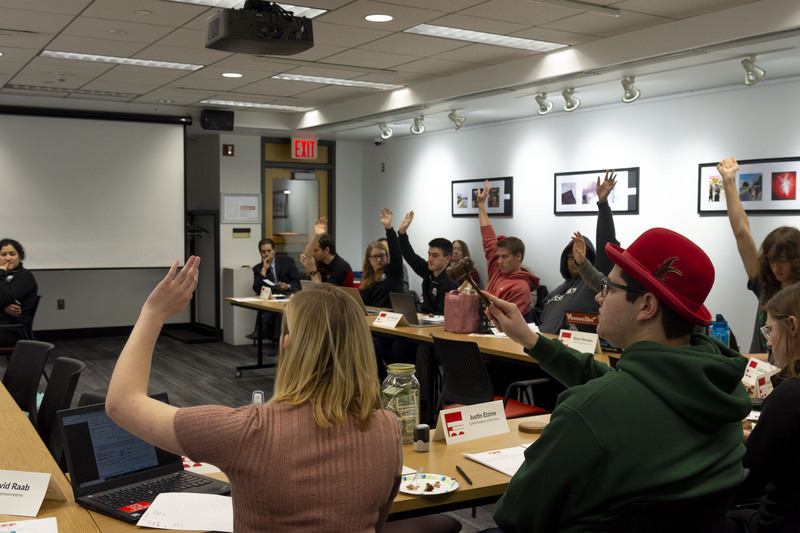 Student government at RPI is broken up into four components: the Student Senate, the Judicial Board, the Class Councils, and the Executive Board. Each body serves a vital purpose to the functioning of the Rensselaer Union and operations on campus. This article will explain the purpose of the Executive Board. The Executive Board is the chief financial body of the Rensselaer Union and is presided over by the president of the Union. The PU is responsible for appointing the majority of the Executive Board membership; three members are appointed by the Senate, Undergraduate Council, and Graduate Council. It is tasked with budgeting the Union’s income each winter, the bulk of which comes from the activity fee that is charged to all students. This money goes toward clubs and their programming; operating the Union, Mueller Center, and RPI Playhouse; the employment of staff; and other student services. During its budgeting season, the Board approves—or disapproves—every program and any associated costs for each Union-funded club. In Fiscal Year 2019, the total projected income from the student activity fee charged to Rensselaer students is $2,828,625. A breakdown of the Union’s income and budgeted expenditures is published yearly in the Union Annual Report. In the past year, the Board approved and subsidized a variety of purchases. These included the construction of a hearthstone in the McNeil Room, furniture replacements for the third floor of the Union, and a new ambulance for RPI Ambulance. Additionally, the Policies Committee, led by Chairperson David Raab ’19, consolidated all of the Union’s documents and policies into the cohesive Rensselaer Union Guidelines and Procedures, allowing easy access to the information by members of the Union.